David Rankin, a Certified Flooring Installer, has been installing carpet for over 25 years. His installations range from small residential jobs to large commercial projects. His quality installation of high end wool carpets prompted him to include the maintenance of carpets by using a dry clean system. Serving Petoskey, Harbor Springs, Cheboygan, Charlevoix, and other parts of Northern Michigan, Dave's Carpet Service offers some of the most quality work in the area! Contact Dave today for all your carpet needs! David Rankin, certified carpet installer, offers quality installation on a wide variety of products in Northern Michigan. He has been installing carpets for over 25 years in the residential and commercial industries. He has taken 3 levels of certification which includes handling fine wools as well as synthetic fibered products. Not only is Dave professional, but Dave is CFI certified. 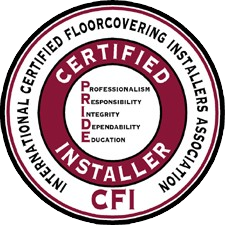 CFI stands for the International Certified Flooring Installers Association, which is an organization of flooring professionals whose purpose is to identify, train and certify flooring installers according to skill and knowledge in order to provide the Industry with the best service! Specialty services, which he provides locally in Northern Michigan, include building and creating custom stairway runners, area rugs, and custom bordering. Services also include repairs and re-stretching. David Rankin has been maintaining carpets with the dry clean system for over 8 years. The dry clean system is used to encapsulate the soil from the carpet fibers and then extracted by vacuuming. Using this "green" product makes it safe for children, animals and the environment. The dry clean system is the recommended treatment for wool carpets, however, it also preserves the life of other synthetic carpet fibers when used routinely in a maintenance program. It also preserves the life of the carpet when used routinely in a maintenance program. The dry clean system also helps businesses remain open due to no drying time after the cleaning. Need to utilize Dave's services? Contact him using the form below or over the phone!